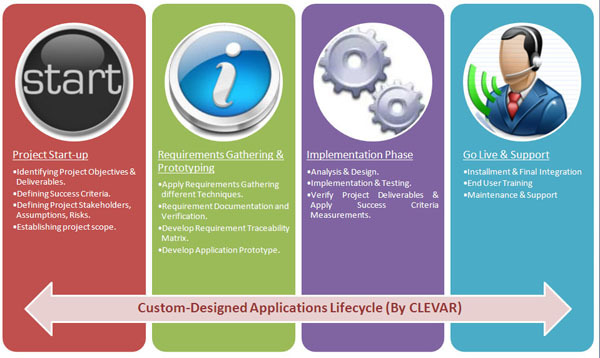 Broaden Your Business Process by Creating a High Quality Custom Designed Applications. Strengthen your Business, Get Competitive Advantages of the Technologies and Serve the Industry Best Services. We, at Clear Vision can create, deploy and maintain customized applications which can be capitalized to improve your business solutions. We develop feature rich applications considering the industry standards and industry evolution which fit to the needs of the customers. Our custom application development solutions enable you to enjoy competitive advantages of the technologies and serve the industry best services. With proven expertise in eBusiness solutions and custom application software development in Saudi Arabia, we can help you maximize operational cost saving and process improvement through B2B integration, Custom application integration, Business Process Management and lot more. Check out our case studies to learn more about how we helped our customers to build custom-design application that fits thier exact needs.